BURLINGTON, Vt. July 30, 2012—Members of the Innu First Nation from Quebec and the Nulhegan Abenaki of Vermont were denied access to the 36th Conference of New England Governors and Eastern Canadian Premiers this morning. 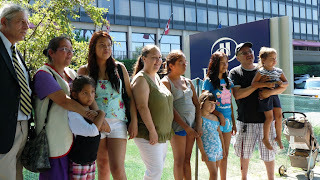 Around 9:30 am, while governors and premiers were discussing access to renewable energy, Charles Megeso of the Nulhegan Abenaki and Elyse Vollant, from the Innu community of Uashat-Maniutenam entered the Hilton Hotel and asked to speak with governors and have a seat at the table, according to Megeso. Vollant, who traveled 12 hours from northern Quebec with three of her children and one other family member, is opposed to Hydro-Quebec development on the La Romaine River and the Plan Nord. The delegation sees themselves as stakeholders in these projects who have not been consulted, and are representative of many other Innu families. Both projects threaten their traditional lands and cultures, which have been under attack from the Quebec government for the past century. Vollant was arrested in March 2012 during a blockade near her community along Highway 138. The blockade was in opposition to Plan Nord, an $80 billion dollar industrial development project on indigenous land north of the 49thparallel in Quebec. While the voices of First Nations people were silenced at the conference, a delegation of Chinese officials, including vice-governor of Heilongjiang Province, Liu Guozhong, were given 15 minutes of floor space to address the governors and premiers on trade and the Chinese economy. According to Megeso, “The Chinese have invested a lot of capital into a lot of these places…the dam on the Yangtze River was built by engineers from Hydro-Quebec." 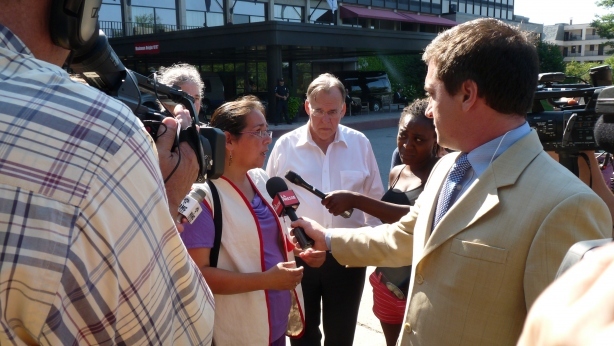 After being denied access to the conference, Vollant and Megeso, supported by members of Red Clover Climate Justice Collective, held a press conference on the lawn in front of the Hilton.